Best Places Northwest - Editor's Choice, Best Places to Kiss. Luxurious grand suites and guestrooms. Scrumptious breakfasts and gracious hospitality - just 3 short blocks to Oregon Shakespeare Festival theatres, restaurants and shops. A four star hotel might have greater luxury, but hardly such comfort. Fully furnished Vacations Rentals also available - accommodating up to 7 people. Email: stay@cowslip.com or call (541)941-6961 for more information and discount rates. 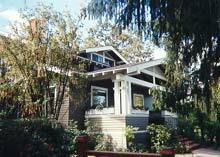 Original Cowslip’s Belle B&B innkeepers since 1984, we have built a strong Ashland bed and breakfast network in the Ashland community, and look forward to sharing our wonderful town with you. Whether you wish to explore by foot or car, we'll be happy to help plan your Ashland vacation or answer your questions. We can also assist you with reservations for dinner, Southern Oregon raft trips, bike rentals, or any other activity you choose.